Hofstra University gratefully acknowledges the financial support of the Long Island Regional Chapter of the Italian American Studies Association and the Association of Italian American Educator, Cav. Josephine Maietta, president. All events are FREE and open to the public, unless otherwise indicated. Reservations will be honored on a first-come, first-serve basis. 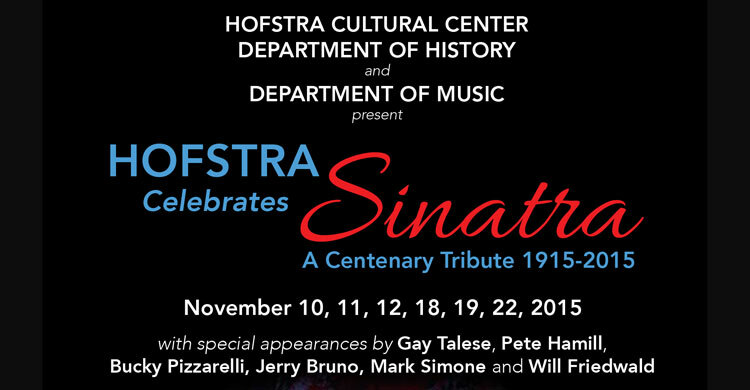 For more information, please contact the Hofstra Cultural Center at 516-463-5669. This presentation is based on research that led to the book Un biculturalismo negato: la letteratura “italiana” negli Stati Uniti (Franco Cesati Editore, 2018). Anthony J. Tamburri examines five writers who live in the United States and write prose and poetry in Italian. Questions posed include: Where does “Italian” end and “Italian-American” begin? What are the issues raised by language? What relationship exists between literature in Italian written in Italy and literature in Italian written elsewhere? Lynne Lawner will discuss “the splendors and miseries” of Renaissance Italian courtesans, major figures in the cultural and social life of the era, above all in Rome and Venice.Muses and models for great writers and artists, they were noted for their own poetry, musical talent, and conversation. Dr. Stanislao Pugliese discusses his new book, Delirious Naples: A Cultural History of the City of the Sun, based on the Hofstra Cultural Center conference held in 2011. The book, edited with Dr. Pellegrino D’Acierno, boasts two dozen essays by leading scholars, writers, and artists. The lecture includes images of Naples and a discussion focusing on the renaissance of the city and its relationship with New York City. Special guest speaker Massimiliano Verde will discuss international promotion and teaching the Neapolitan language and cultural heritage. For more information please contact the Hofstra Cultural Center at (516) 463-5669, M-F, 9 a.m.-5 p.m.
All events are FREE and open to the public, unless otherwise indicated. Advance registration is requested. President, The Triangle Factory Fire Coalition Inc. Released by IFC Films Sundance Selects, playing in theaters, on-demand and on Hulu now! Thursday, November 1, 7 p.m.
Events in Charlottesville, Virginia, have reignited a longstanding debate over how the past should be remembered in public spaces. Italian-Americans have a responsibility to participate in the larger national conversation about how to remember their history and experiences in the United States. Professor Fraser Ottanelli will explore the relationship between memory, identity, and politics by focusing the debate surrounding statues of Christopher Columbus and the ancient Roman column commemorating the 1933 transatlantic flight of fascist aviator Italo Balbo in Chicago. The presentation will highlight the two-volume collection, New Italian Migrations to the United States (University of Illinois Press, 2017), which offers a radical rethinking of the history of Italian-Americans. The books’ editors will discuss how the continual immigration from Italy over the past 70 years has influenced immigration laws, impacted local communities, contributed to consumer culture, and continues to reboot Italian-American and U.S. culture in still-unfolding ways. A film screening of Brooklyn Roses by Christine Noschese. Professor Christine Noschese is an Emmy award-winning writer, director and producer of both narrative and documentary films. In Brooklyn Roses, Professor Noschese blends documentary and fiction to re-examine her childhood and her mother’s feminist struggles in 1950s and ’60s working class Brooklyn. The film had its world premiere at the 2017 Fic Autor (Author’s International Film Festival) in Guadalajara, Jalisco, Mexico, where it was awarded best documentary feature. The Italian American Experience Lecture Series is presented by the Hofstra Cultural Center and supported, in part, by the Association of Italian American Educators and the Long Island Regional Chapter of the Italian American Studies Association. The Routledge History of Italian Americans is a new, multi-authored history of one of the largest ethnic groups in America. 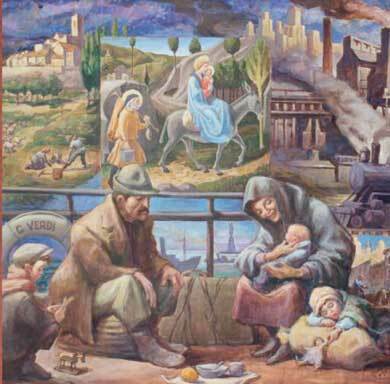 Concentrating on themes ranging from immigration to religion, and labor rights to women’s rights, this collection reflects the field of Italian American studies as it exists now, and brings out aspects of Italian American culture that make this ethnic group one of the most interesting in the American experience. Tuesday, November 21, 7 p.m. Presented by the Hofstra Cultural Center and supported, in part, by the Association of Italian American Educators. Generations: From Immigrant to Second, Third, Fourth — and Beyond "Salad Bowl" to "Melting Pot"
Speaker for all three lectures: Michael D'Innocenzo, distinguished professor emeritus, Hofstra University. Tuesday, November 1, 7 p.m.
BlaxploItalianis a documentary that uncovers the careers of a population of entertainers seldom heard from before: Black actors in Italian cinema.BlaxploItalian cleverly discloses the personal struggles classic Afro-Italian and African diasporic actors faced, correlating it with the contemporary actors who work diligently to find respectable and significant roles. More than an unveiling of history, it is a call-to-action for increased diversity and esteem in international cinema. 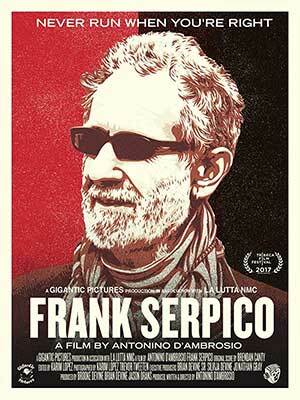 The story of two elderly men whose ways of life have survived from medieval Italy. Sergio, a sharecropper, uses ancient farming methods that have become overshadowed by corporate agriculture, and Father Oreste Benzi, a Roman Catholic priest, fights the tide of sexual slavery. Both represent ways of life that are rapidly fading as the modern world closes in. 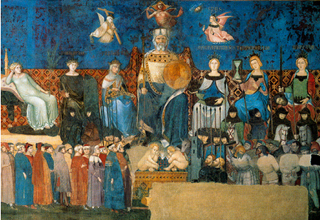 The point of departure for exploring their parallel lives is the 14th-century fresco, The Allegory of Good and Bad Government, by Ambrogio Lorenzetti. The story of how World War II bicycling idol Gino Bartali, physician Giovanni Borromeo and other Italians worked with Jewish leaders and high-ranking officials of the Catholic Church, risking their lives by defying the Nazis to save thousands of Italy’s Jews. Tuesday, March 15, 7 p.m. This film offers an inspiring portrait of three Italian master tailors who confront the decline of the apprentice system as they navigate their challenging roles in the twilight of their careers. The film unravels the mystery of their artistry and reveals how their passionate devotion to their Old World craft is akin to a religion. All events are FREE and open to the public, unless otherwise indicated. Advance registration is required. A century after his birth, Frank Sinatra still looms large in the American imagination and in our popular culture. Join us as we celebrate his 100th birthday and his extraordinary life and career with a series of lectures, interviews, and a master class followed by musical interludes by Hofstra students, professional singers and musicians from The Great American Song Book. Featuring legendary musicians who played and toured with Frank Sinatra: Jerry Bruno, bass, D’Addario Foundation Visiting Artists; and Grammy Award-nominated jazz vocalist Jane Monheit; authors and biographers James Kaplan, David Evanier and Will Friedwald; scholars John Gennari, University of Vermont, and Shalom Goldman, Middlebury College; journalists Sandy Kenyon, WABC-TV, Carol D’Auria, 1010 WINS, and Mark Rotella, Publishers Weekly; multimedia journalist and founding member Greg Dunmore, National Association of Black Journalists; and Sal Scognamillo, Patsy’s Italian Restaurant. Bassist Jerry Bruno, who played and toured with Sinatra, will be interviewed at 5 p.m. by John Bohannon, host of WRHU-FM’s The Jazz Café. The interview is followed by an 8 p.m. master class. Thursday, November 12, 4 p.m.
“Racism, Civil Rights and Israel” focuses on Sinatra as a champion of civil rights and a staunch supporter of Israel. There will also be a screening of 1945’s The House I Live In, a short film opposing anti-Semitism, starring Sinatra. The Great American Songbook: Past, Present and Future is a panel that features musician, record producer and songwriter David Finck; musical director, pianist and arranger Tedd Firth; Grammy-nominated jazz vocalist Jane Monheit; and Debbi Whiting, president of My Ideal Music. “Lessons Learned From Sinatra” is a lecture and master class with radio personality Mark Simone. Wednesday, November 18, 8 p.m.
Will Friedwald, music critic and author of Sinatra! The Song Is You: A Singer’s Art, presents “Sinatra: The Television Factor,” with an introduction by Robert Foster, executive director of the Hoboken Historical Museum. “Frank Sinatra and Italian American Culture” features University of Vermont Professor John Gennari; Joe Scognamillo and Sal Scognamillo of Patsy’s Restaurant in New York City; author Mark Rotella; and scholar Rocco Marinaccio. “Assessing Frank Sinatra” features celebrity journalist Sandy Kenyon, music critic and author Will Friedwald, Sinatra biographer James Kaplan, radio host Ron Forman, and Bronx Opera Company Artistic Director Michael Spierman. Sunday, November 22, 7 p.m. This performance takes place at The Helene Fortunoff Theater. 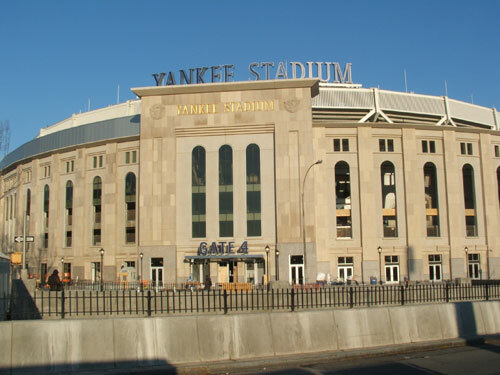 Tickets are $10, $8 for senior citizens (over 65) or non-Hofstra students with ID. Tuesday, March 10, 7 p.m. Recognized by Michelangelo, Sofonisba Anguissola became a court painter for King Philip II of Spain and lady-in-waiting to the king’s third wife, Elisabeth of Valois. This presentation explores Sofonisba Anguissola’s expertise as an artist, as well as her intelligence, determination and independent spirit. Historical perspectives and a connection to Verdi’s Don Carlo round out this diverse presentation of art, music, history, culture and real-life escapades. You can almost smell the aroma of roasting garlic and hear the laughter of the nonnas punctuating their daily conversations about the truly important things in life – family, faith, and the best way to prepare roast pork! Fran Claro serves up a savory slice of Americana, complete with mouth-watering recipes straight from the nonnas of Brooklyn. The Macaroni’s in the Basement is a treat for the soul and for the taste buds. Tuesday, April 28, 7 p.m.
A work of historical fiction based on an actual soccer match that occurred near Palermo on July 10, 1943, the same day the Allied forces nvaded Sicily during World War II – based on a story retold by the only player still alive among both teams. Many factual details are included on subjects ranging from ancient mythology, art history and literature, to the sociological bases and consequences of emigration across many decades of the Sicilian experience. the Italian immigrant's largely forgotten role in creating the monument. young wife and mother in Brooklyn… is haunted by hard questions from her past." Speaker: Stefano Vaccara, Lehman College/CUNY, Editor-in-Chief, "La Voce di New York"
Speaker: Ann Pizzorusso is a geologist-naturalist whose first book uses the Renaissance genius to explore Italy’s underground secrets that have confounded people since the dawn of time: from the gateway to the underworld to the stairway to heaven and the gems described by Dante in the Divine Comedy. Wednesday, November 19, 11:30 a.m.
Speaker: Amara Lakhous, author, Clash of Civilizations Over an Elevator in Piazza Vittorio, examines the theme of identity through the descriptions of idiosyncrasies in multicultural Italy by way of a story of a murder in Rome. Tuesday, December 2, 9:30 a.m.
A revealing picture of Parenti's early years as a youth in New York's East Harlem, along with some of the influences that helped shape his lifelong commitment to activism and social justice. Fred Kuwornu, film director and activist, will present two of his acclaimed documentaries and conduct a question and answer period after each screening. Through stories set in seven Italian communities throughout California, this film examines how economic and social mobility became possible for many Italians in the Golden State. It is also a look at how immigrant identity is maintained and transformed as immigrants become assimilated into mainstream America. Award-winning filmmaker Anton Evangelista's heart-warming documentary about the epic story of Umberto Evangelista, a dynamic and charming ninety-year-old Italian immigrant. Hofstra University gratefully acknowledges the financial support of the Long Island Regional Chapter of the Italian American Studies Association (www.italianamerican studies.net) and the Association of Italian American Educators, Cav. Josephine Maietta, President.